Council for the Indian School Certificate Examination (CISCE) declared Indian Certificate of Secondary Education (ICSE) and Indian School Certificate Examination (ISC) results 2017 today. Candidates who had appeared for the ICSE 10th class and ISC 12th class exams checked their results. 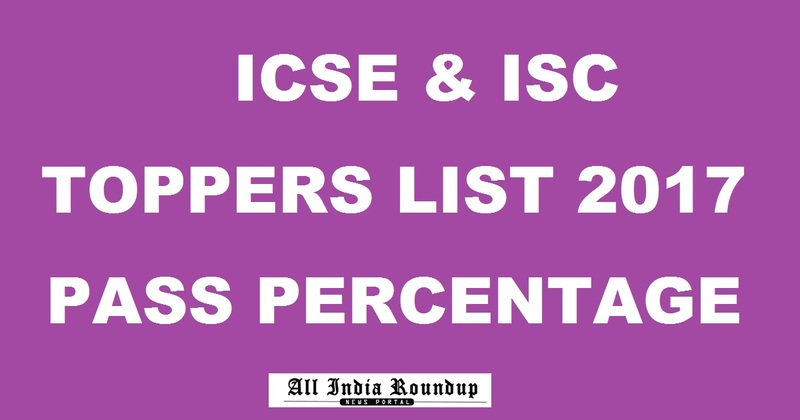 Now, students are searching for the toppers marks and pass percentage for both ICSE and ISC 2017. Here we have provided the toppers list along with the scores obtained by them. Candidates can check the pass percentage analysis for 10th & 12th Class examination. Council for the Indian School Certificate Examinations (abbreviated as CISCE) is a national level, private, Board of School education in India that conducts the Indian Certificate of Secondary Education and the Indian School Certificate examinations for Class X and Class XII respectively. It was established in 1958. ISC is a private non-Governmental board of School Education in India. The Council for the Indian School Certificate Examinations is committed to serving the nation’s children, through high-quality educational endeavours, empowering them to contribute towards a humane, just and pluralistic society, promoting introspective living, by creating exciting learning opportunities, with a commitment to excellence. The Council for the Indian School Certificate Examinations conducts three examinations, namely, the Indian Certificate of Secondary Education (ICSE –Class X); The Indian School Certificate (ISC – ClassXII) and the Certificate in Vocational Education (CVE – Year 12). The subject choices and syllabuses prescribed for these examinations are varied and aimed at nurturing the unique gifts of individual pupils. This year CISCE conducted ICSE class 10 examination and ISC class 12 examination. All the candidates who had appeared or the examination can check the toppers list and pass percentages for both the years from the direct link provided below. Ananya Maity from Heritage School Kolkata scores 99.5% in ISC exam, secures 1st position. Shashwat Saxena from St.Mary, Meerut Cantt tops ICSE exam in the Delhi-NCR region with 98.6%. The ICSE Class 10 topper this year is Abhineet Parichay with an aggregate score of a whopping 99.2%. He hails from Bolangiri. The second position has been secured by four students (Sudarshan R from Bangalore, Isha Sethi from Mumbai, Manan Manish Shah from Kandivali and Jyotsana Srivastava from Lucknow) with an aggregate of 99 per cent while the third position has been shared by as much as 10 students with 98.8 per cent each. The pass percentage for ICSE Class-10 2016 is 98.5 %. This year, it is the southern region which has performed the best in the ICSE 2016 exams, while the North and East regions are the ones lagging behind. Once again, girls have outperformed boys in the metric examinations although overall, the pass percentage has gone up by 0.1 per cent as compared to 2015 results. In the first position of the ISC Class 12th examination results 2016 is Aadiya Maddi from Mumbai with a whopping 99.7 per cent in the Class 12th examination. The 2nd position is shared by Mansi Puggal with 99.5 percent and the 3rd position is shared by Kavita Desai and Arkdeb Sengupta with 99.25 percent from Kolkata. The pass percentage of ISC is up by 0.18% compared to last year and in ICSE, the pass percentage is up by 0.01% compared to last year. Stay tuned to this website. 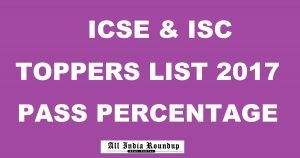 We will update ICSE & ISC Toppers List, highest marks for the academic year 206-2017. Press CTRL+D to bookmark this page for easy navigation.